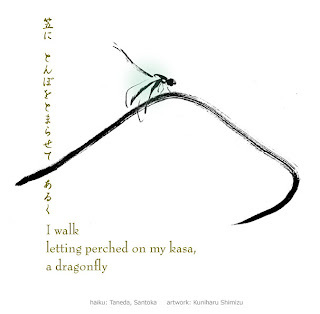 Haiku by Taneda, Santoka. Artwork by myself. This is one of the first Santoka haiga I made. The curving brush stroke depict two things: one a kasa he wore, another the lone path he was walking. I wish someday I could paint in this way. I will keep looking patiently for instruction. Seem like you are enjoying with the dragon fly. Glad the haiku stirred inspiration.